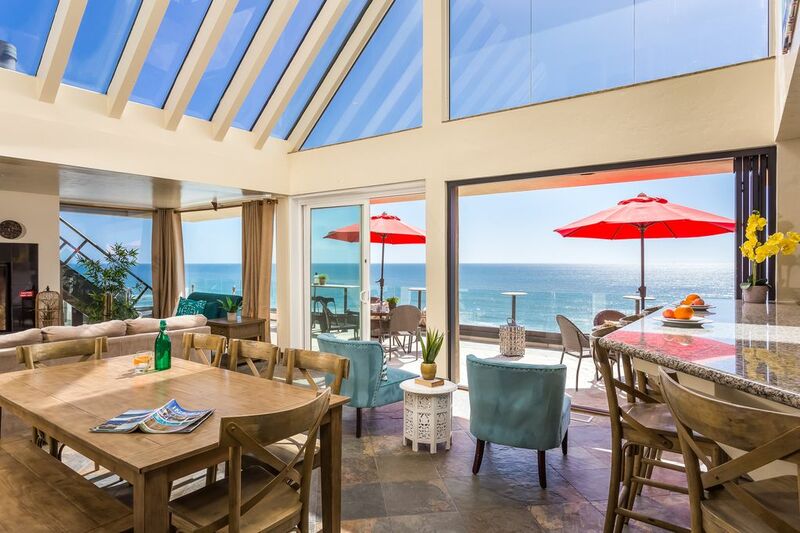 This magnificent beachfront home is the upper level of an oceanfront duplex, sitting on a bluff overlooking the Pacific Coastline. From the rooftop deck, enjoy breathtaking 360-degree views of the ocean to the west, and mountains to the east, as you relax in your private rooftop spa. The views are striking! You walk into a large and open kitchen, living/dining and family room. Plenty of living space! Off of this great-room there is a large oceanfront patio, with patio furniture and barbecue. Beach access is directly adjacent to the south side of the home. Central AC is available to help cool you off after a long hot day. You will not want to leave! This home is located in the quaint beach town of Leucadia, Encinitas. It's just a short walk to Coast Highway where you'll find unique boutiques, mouth watering Mexican food, local coffee houses, antique stores, a new and used record store, and so much more! Stroll down a little further on the weekends and stop by the Seaside Bazaar, North County's only flea market. At night, enjoy home cooking in your oceanfront rental, or check out one of the local neighborhood restaurants such as Haggo's Organic Taco shop, a small Mexican restaurant that is known for the organic tacos that it serves. In addition, you can quench your thirst by visiting one of Encinitas' breweries like the Priority Public House, which is located in Leucadia. It is a locally owned American style gastropub with 22 craft beers on tap, a great cocktail list and a small wine collection. They work with local vendors, all meats are natural, hormone free and the beef is grass fed. There motto is "stay focused on what's important," and it shows from the location, to the decorations, to the drinks, all the way to the food. Open for lunch and dinner with an awesome happy hour, you can come and enjoy this local hot spot. Your comfort during your stay is very important to us- that's why we've stocked this home with plenty of conveniences you may need during your stay. Each room boasts comfortable, clean furniture. You'll find linens, beach towels - even spices and cooking gadgets stocked within the rooms, so you'll have everything you need at your fingertips. Make your next vacation a beachfront experience. The memories you create with family and friends will last a lifetime! Check out some of these first-hand accounts from other guests who have spent time at our beachfront vacation rentals, or view some of their photos! I love San Diego! Providing a memorable experience on our home and in San Diego is what we strive for. What better place than beautiful San Diego where the weather is arguably the best in the world year round, with some of the finest beaches.